From Boston.com August 31, 2012. After Bernanke’s comments were released at 10 a.m. Eastern time, stocks initially gave up most of their earlier gains. But as investors digested the speech, stocks bounced back. By late morning, the Dow Jones industrial average was up more than 100 points. Broader stock indexes also surged. Bernanke noted that further action carries risks but says the Fed can manage them. The Fed ‘‘should not rule out’’ new policies to improve the job market, he said. The most dramatic step the Fed could take would be another round of bond buying. This is known as quantitative easing, or QE. In two rounds of QE, the Fed bought more than $2 trillion of Treasury bonds and mortgage-backed securities. Many investors have been hoping for a third round — QE3— to be unveiled as soon as the Fed’s next policy meeting in September. “Bernanke’s comments Friday made clear that the economy has a long way back to full health. From the US Labor Department August 30, 2012. I recently issued a request for citizen journalists to assist in researching an important story that is playing out before us in real time. The Rod Blagojevich appeal process has been delayed in direct contradiction to US Court rules and guidelines. 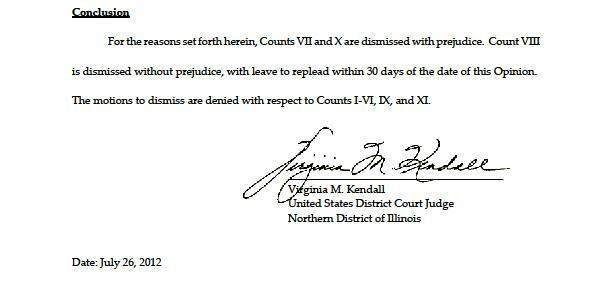 The court reporter for Judge James Zagel, the person responsible for producing trial transcripts needed for the appeal, took a 5 and 1/2 month leave of absence and now has filed a request for an extension. She now claims to have the transcripts ready by late September. Read the guidelines for yourself. The Court Reporter has accountability, Judge James Zagel has accountability and the 7th Circuit Court of Appeals has accountability. This case impacts a former governor and current occupant of the White House. Over the past almost 4 years I have presented compelling circumstantial evidence why Blagojevich should have been arrested much earlier and before Tony Rezko. Certainly not after the 2008 election to protect Obama. There is so much to keep up with about Obama, some may have forgotten some details and new readers come along, so I will be presenting some information again. In part 1 of a multi part series, I will lay out the facts in detail that support my contention. To paraphrase Dickens, it is important to know this information to understand what is happening now. 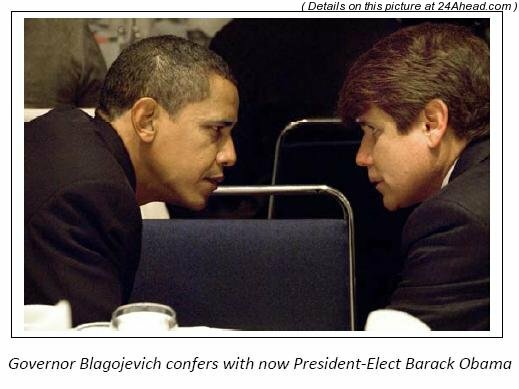 Part 1 – Events leading up to the Blagojevich arrest. Oh, and by the way, another spectre from Obama’s past is about to pay him a visit soon. I will say more about this when I am permitted. From News Busters August 26, 2012. “Thanks to the graph, yours truly doesn’t need to bore readers with lots of numbers. 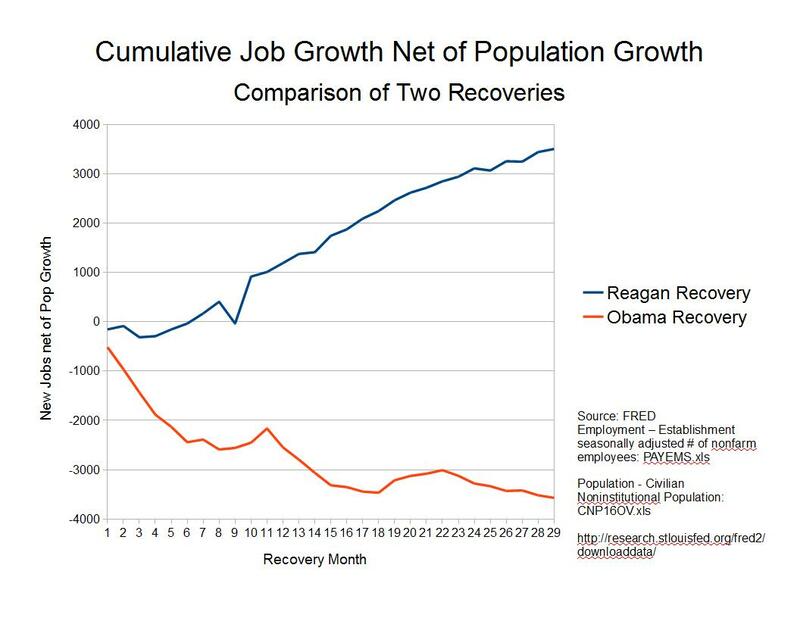 Outside of very small blips, there is virtually no point on the above graph where the trajectory of job growth under Obama is as high as that seen under Reagan, even though the Reagan-era workforce was about one-third smaller. If done on percentage of workforce, the slope of the Reagan-era ascent would be even steeper. Obviously, congress is mostly at fault. The Democrats controlled both houses beginning in 2007 to create a “perfect storm” of failing liberal policies with the help of Obama. 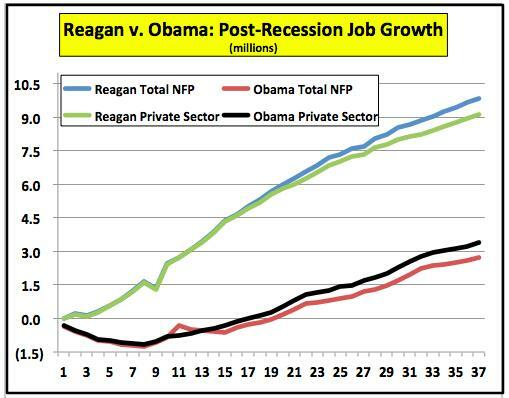 Reagan inherited an economic mess from Carter. Many of you remember the long gas lines and 18 percent mortgage rates from the Carter years. In January 1983, 2 years after Reagan took office, the unemployment rate was 10.4 percent. In January 1989, when reagan left office, the rate was 5.4 percent. When George Bush took office in January 2001, the unemployment rate was 4.2 percent. When the Democrats took control of congress in January 2007, the rate was 4.6 percent. So, the impact of a Democrat congress with the addition of Barack Obama in January 2009 led to an unemployment rate of 9.1 percent in January 2011. The Republicans took control of the house in January 2011. The stated unemployment rate is 8.3 percent but would be much higher if so many folks had not dropped out of the labor force. From the Ulsterman, February 24, 2012. In print in NC, the Rhino Times August 23, 2012. “Four years ago the stars lined up for Obama. He got into the Democratic primary in order to get name recognition and maybe a slot in President Hillary Clinton’s cabinet. Then the accidental candidate won Iowa and realized that with one more primary win – South Carolina – he could be president. Everyone loved Obama because of his unlikely story, and he gave great speeches. Some noticed that he didn’t really say anything in the speeches, but those who noticed were mostly Republicans and nobody paid any attention to them. The media went gaga. They reported only the good stuff about Obama. And the Republicans couldn’t have helped more. They nominated an old worn-out, politically compromised senator who had been in Washington for so long he actually thought he could run with the same running mate as former Vice President Al Gore. Failing that he picked Alaska Gov. Sarah Palin, who, as it turned out, was a brilliant pick for about two weeks. But then McCain turned her over to the political buffoons who were running his campaign, and Katie Couric in one interview completely destroyed Palin’s credibility. But there you have it, the news media stepped in and did what Obama needed to have done to make certain he would win. I subscribed to Newsweek for about 15 years. I stopped my subscription recently, and even when the renewals got down around $10 a year I refused to bite because I was tired of reading about the messiah who we had elected president. There was nothing that Obama could do that wasn’t wonderful in the eyes of Newsweek. Since I already receive White House press releases, Newsweek seemed redundant. Now, Newsweek has on its cover that Obama must go and it is a well-written, factual article. The very fact that Obama cheerleader Paul Krugman felt the need to instantly challenge the article is evidence of its damaging effect. The article goes through the promises that Obama made at his inauguration and how he has failed to keep them. The economy is the big issue. But there are others, like promising no middle-class tax increase when Obamacare is a huge tax increase on the middle class, and we know it is a tax because the Supreme Court said it was. 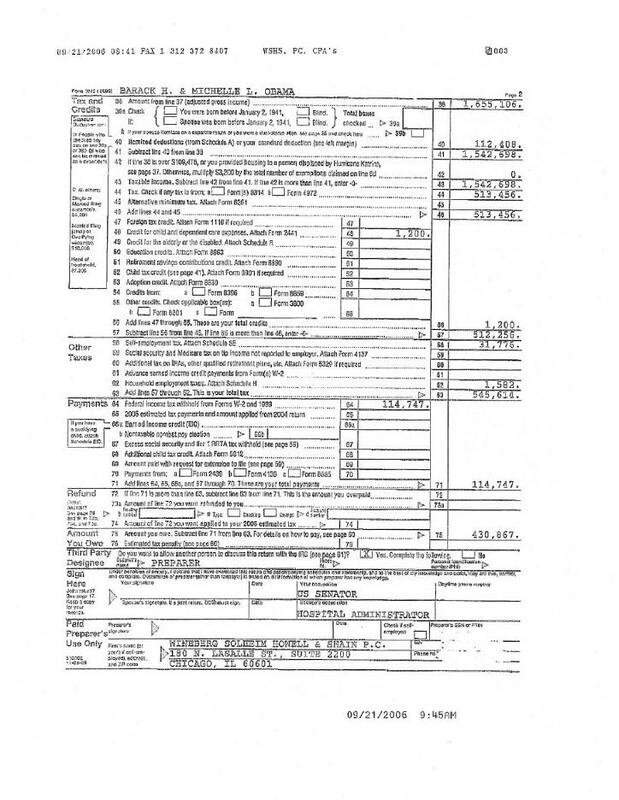 Usually you have to wait until after the election for the dirt to come out about campaign staffs, but there is already an e-book out about the 2012 Obama campaign and how it is beginning to fall apart. One of the passages in the book is about how Obama doesn’t make big economic decisions because he doesn’t understand what he is supposed to be deciding. Obama has no knowledge or experience that would indicate that he understands economics at an international level. Obama thought there was such a thing as a “shovel ready” government project when he signed the $1 trillion stimulus package. It was only much later when the money wasn’t being spent that he found out that shovel-ready projects are a lot like unicorns, people may talk about them but you can’t really put your finger on one. If the Obama 2012 campaign kickoff is a foreshadowing of things to come it is going to be a long fall for Obama. The kickoff did exactly what a campaign doesn’t want to ever do: It put the candidate in front of thousands of empty seats. Obama just doesn’t have the drawing power that he did and the campaign realized too late that despite all of their efforts they weren’t going to fill the arena. It’s not the way you want to kick off a campaign. A candidate is better off speaking to a crowd of 200 in an overflowing room than a crowd of 10,000 in a 20,000-seat arena. That is campaigning 101. It wasn’t such a bad mistake but it is a sign that Obama’s 2012 campaign is not going to be anything like his 2008 campaign. If you are getting your news from ABC, it’s time to stop. The networks other than Fox all tilt strongly left, but ABC is willing to lie, or else is filled with total incompetence. All of us in the news business make mistakes. Last week we managed to misspell sheriff, but ABC has taken mistakes to a new level. 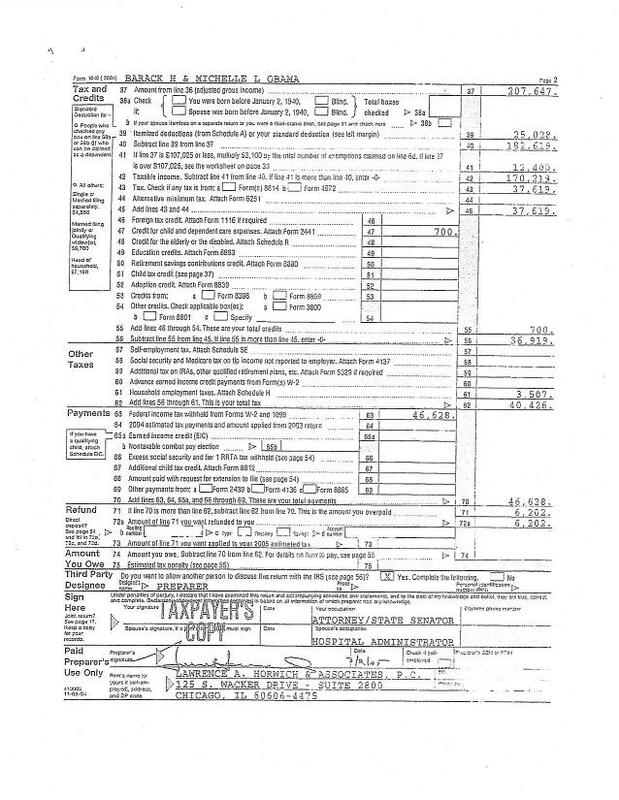 First, it reported that the Aurora, Colorado, shooter was a member of the Tea Party. He wasn’t, but someone with a similar name was. This is a huge story and you simply don’t make that kind of mistake in an election year by accident. Second, when ABC called the shooter’s mother she said, “You have the right person,” meaning she was the mother of the young man they were asking about. ABC managed to interpret that to mean, “Yes, my son did the shooting,” which is a really bizarre interpretation and sounds a lot like the leaps of faith that the News & Record makes. Third, ABC reported that filmmaker Tony Scott, who jumped to his death from a bridge in Los Angeles, had inoperable brain cancer. He did not. ABC, sadly, is simply putting rumors and innuendo on the air as news. Any of the three mistakes could be explained away, but all three is a pattern. Nobody is watching the store.